Tall and regal for her 18 years, Lesya Zhukovska turns heads as she walks from her apartment in Santee to do some Christmas shopping. The Ukrainian-born beauty with brains is used to getting stares. She warmly returns the smiles to people she passes on the streets just like the pageant winner she is. The teen has competed in a total of 16 pageants since she got her first taste of pageants just a few years ago. In 2011, she captured the title of Miss Teen Central San Diego as well as Miss Photogenic. Like most young women, Zhukovska has a following of friends on Facebook. She suggested to the pageant judges that there be a contest called Facebook Fan Favorite. She won that title at both the Miss Teen Central San Diego and the Miss Santee pageants. Zhukovska plans to keep on going. “I have a passion for pageants. It’s my hobby,” she said. But it is not the glitz or the glamour that Zhukovska is going for. “There’s a huge distinction between the ‘stereotypical toddler and tiara (pageant) type’, and the ‘community service, scholarship and personality (pageant) types’. I only do the good ones,” she said. The ‘good ones,’ according to Zhukovska, are those that reward hard work and focus on community service. She loves volunteering, particularly with children, such as she did at the recent Santee Tree Lighting Ceremony, a Christmas tradition for families with children. The young lady received the President’s Volunteer Service Award in 2011 for donating over 100 hours of her time to various organizations. “The award was signed by President Obama,” she said. But Zhukovska admitted that pageantry continues to be her biggest passion, explaining that she considers pageantry as an art form and a celebration of beauty. “Whenever I watch a pageant, I’m so overwhelmed with excitement that I’m on the verge of crying every time. My participation in this art has shaped who I am tremendously. I’m more confident, outspoken and involved in my community than I would have ever been otherwise,” she said. This passion inspires Zhukovska to jump at any opportunity she can find to help at or contribute to a pageant. For instance, she volunteered as an assistant judge for the Miss College Grove/Lemon Grove/ Spring Valley Pageant Association last spring. Her friends, as well as people who meet her for the first time are captivated by Zhukovska’s statuesque beauty as well as her focus on reaching her goals. She possesses a unique gratitude for both the things she has, as well as what she has been able to accomplish. When she was four years old, Zhukovska’s family emigrated from Russia in hopes of a better life. After the collapse of the Soviet Union in 1991, just a few years before Zhukovska was born, all the Soviet republics were suffering from an economic crisis. Life was getting increasingly more difficult for her family, as food and other necessities were difficult to come by. “Moving here was the most significant event in my life. Growing up in America has been a huge blessing,” she said. Russian literature in the first half of the 19th century. The poet was also a tutor for Tsar Alexander II, and he has been credited with introducing the Romantic Movement into Russia. 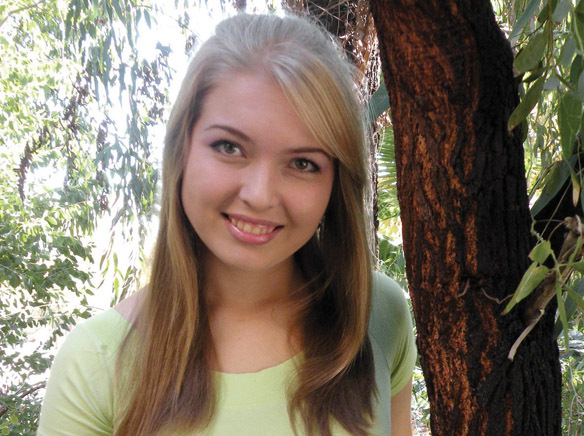 Having inherited an appreciation for critical and reflective thinking, Zhukovska managed to graduate from Santee’s West Hills High school at age 16. She skipped one year both of elementary school and high school. Her goal is to earn a degree in Communications before she turns 20 years old. “I want to work in a university to help with the Study Abroad programs for International Student Services,” said Zhukovska. She gained some practical experience in college as the Ukrainian-born American representative on the International Students Council. Currently, Zhukovska has every intention of graduating with a Bachelor of Arts degree, which she plans on obtaining from Belmont University in Nashville, Tennessee by the end of 2013. In addition, she is also in the running for the upcoming Miss Amway Scholarship Contest. “You win by getting Facebook votes,” she explained. To get into the contest, she wrote an essay and submitted a photo of herself. Zhukovska explained that she lives by the motto, “If you want to be happy, be.” She has chosen to cherish everything she currently has in life, and plans to continue to reach even higher.